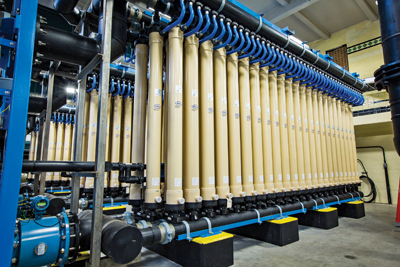 In the past 15 years, microfiltration (MF) and ultrafiltration (UF) membranes have emerged as leading technologies for municipal and industrial water treatment. Once thought to be non-competitive versus conventional treatment, especially for large installations, MF/UF systems have proven to be a cost-effective option for drinking water treatment, water reuse and industrial water treatment. Two primary types of membrane systems are available: pressure and submerged. In a pressure system, membranes are mounted in a housing and feedwater is forced through pores with a pressure pump. In a submerged system, the membranes are placed in a basin or tank that is open to the atmosphere. Feedwater is introduced into the tank or basin and the filtrate is drawn through the membranes via a vacuum pump. In both cases, MF or UF membranes with pore sizes from 0.01 to 0.1 μ are used in a hollow-fiber format. Polyvinylidene fluoride membranes often are specified to provide durability and chemical compatibility. While both types of systems utilize membranes to treat feedwater, the similarities between the systems end there, as they differ in infrastructure requirements, operating structure and capabilities, maintenance needs and lifetime cost. Above image: Pressure membrane systems, like this one in Wilmington, Del., treat water at a range of pressures and are ideal for cold climates. The primary difference between pressure and submerged systems is that pressure systems can operate within a large pressure range, while submerged systems are limited to atmospheric pressure. Submerged systems may operate at average pressures approaching 70% (10 to 11 psi at sea level) of the maximum pressure differential available. Pressure systems typically operate at 30% to 50% (12 to 20 psig) of the maximum trans-membrane pressure when tested on the same waters. This builds an intrinsic safety factor into a design, allowing the pressure system to cope with process upset, changes in influent water quality, or other changes in plant operation. As shown in Table 1, reliance on atmospheric pressure hampers submerged systems if they are installed at elevations higher than 4,000 ft, where atmospheric pressure becomes noticeably reduced. For example, in an application at 4,000 ft above sea level, atmospheric pressure drops from 14.7 to 12.7 psi. Lower atmospheric pressure means less available differential pressure, translating into lower fluxes, larger footprint and higher costs. In applications in which the feedwater is coagulated and settled, pressure systems typically operate at fluxes higher than 80 gal per sq ft per day (gfd). One installation in Tennessee has effectively operated at 88 gfd for more than eight years. Submerged systems typically are designed at lower fluxes, which may peak at 40 to 45 gfd. The ability to treat water in cold climates is another differentiator between the two types of systems. In winter, feedwater temperatures drop, increasing viscosity and the driving force required to force water through a membrane pore. This affects submerged systems, since their maximum differential pressure is limited by atmospheric pressure, forcing submerged systems to be sized at lower fluxes. For pressurized membrane systems, cold water is not a problem. By holding the flux constant, the higher viscosity of the water slightly increases differential pressure, which the pressurized system can accommodate. By the very nature of their operation, pressure systems operate in a wider differential pressure range (0 to 40 psid). This allows them to provide consistent flows, regardless of feedwater temperature. When it comes to integrity testing of a membrane fiber, pressure systems have several advantages. They use the pressure decay test, an automated and widely accepted procedure. Membrane fibers also can be pressurized more than 2.5 times those in a submerged system. This enables small breaches of membrane integrity to be detected easily and rapidly. In a pressure system, each module is equipped with a clear coupling on the filtrate side. This allows a plant operator to quickly identify the module with the broken fiber. In the rare instance when a broken fiber has been found, an operator can identify and repair it in less than 30 minutes. Submerged systems often utilize the bubble point test or particle counting method. Identification and repair of leaked fibers in these systems require the removal of the module bundles from the basin, resulting in downtime. When converting from conventional treatment to UF/MF, the existing basins can be used to accommodate a submerged system. In this case, a submerged system may offer lower capital costs compared to a pressure system retrofit. However, if there are no available basins, the civil construction costs must be accounted for as part of the overall cost. Another cost factor for submerged system is installation of an overhead crane to remove membrane cassettes from the basin. Pressure systems do not require basin construction or lifting mechanisms and can be installed on a concrete pad. Submerged and pressure membrane systems offer excellent solids and pathogen removal to meet drinking water standards or provide protection for downstream equipment in reuse applications. Both systems provide high-quality filtrate regardless of variations in incoming water conditions, as long as the membranes are intact. Buyers should check with suppliers on fiber breakage rates in actual service. Submerged systems have been promoted and used for large systems and for high solids/poor quality feed sources. Material advances, process optimization, and an increase in experience treating different types of waters have allowed pressure systems to effectively compete in these applications. As technology has improved in the two decades since membrane systems hit the market, these systems have pushed the industry to new levels. As competition between pressure and submerged systems increases, customers may wish to weigh the benefits of each. The competitive advantages can improve plant operation, facilitate equipment maintenance, and ensure water meets requirements. Joseph Swiezbin is director of technology for Pall Corp.’s Process Systems group. Swiezbin can be reached at [email protected].